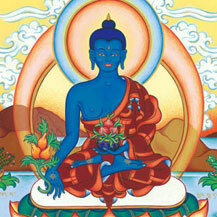 The Medicine Buddha is the Buddha of Ultimate Healing. And in the Tibetan Buddhist tradition this means that this Buddha and his mantra not only stand for physical healing, but for mental healing as well, because only if the body and mind are in balance, healing to the highest level can be reached. ‘Tayatha’ always stands at the beginning of a mantra. It means so much as ‘it is like this’ and may also be left out when you recite the mantra for yourself or somebody else who needs healing energy.